Solo Instrumental or Spoken Word? The genre of the melodrama finds little place amid modern cataloguing demands, yet was a particular favourite in the nineteenth century, with examples by Schubert and Richard Strauss, among many others. On this recording Liszt's five surviving such works cover a wide range of human emotion and experience: the despairing fidelity of Lenore which leads her to irreversible blasphemy; the fatal haunting of the once-fearless knight confronted by a ghostly monk; the dead King who remains faithful to his Sigrun even amid the delights of heaven; the widow wooed by a mysterious apparation; and Tolstoy's blind musician, too devoted to his song to care when he performs without the intended audience. These ballads, recited in their original languages (three German, one each Hungarian and Russian—full texts and translations into English, French and, where applicable, German provided), are accompanied and adorned by Liszt's expressive piano parts, Der traurige Mönch being of particular interest as an early example of the true atonality which Liszt was not to develop upon for many years. 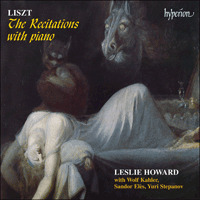 This latest volume in Leslie Howard's gargantuan survey of Liszt's piano music certainly stands out from the others. The works recorded here are included in this series for the very good reason that the piano is the only musical instrument involved. It is, in any case, an excellent opportunity to rescue five strange and moving works from the dusty shelves to which they had been consigned for no better excuse than the form of the melodrama being out of fashion. The drawing-room melodrama with instrumental accompaniment was quite a popular nineteenth-century form, having its antecedents in opera and Singspiel and its descendants in such works as Pierrot Lunaire and Peter and the Wolf. The recitation with piano was essayed by Schubert and Richard Strauss, among many others. Strauss’s accompanied version of Tennyson’s Enoch Arden probably takes the prize for the largest work in the genre, running for well over an hour in performance; Schubert’s one work, Abschied von der Erde, is included on Volume 26 of Graham Johnson’s series for Hyperion of the complete Schubert Lieder; and Liszt produced five of them. (A sixth, Der ewige Jude, to a text by Schubart, is mentioned in various lists of doubtful or lost works but we have been unable to trace it; the catalogues also list Vor hundert Jahren, S347, as a melodrama with orchestra but it is really a staged dramatic dialogue with a narrator, two characters and orchestra, and quotes several themes associated with other Liszt works or arrangements: the trio from the ‘March of the Three Kings’ from Christus, Gaudeamus igitur, the ‘Ode to Joy’ from Beethoven’s Ninth Symphony, and Le mal du pays from the first of the Années de Pèlerinage). Lenore was a very popular poem in its day, and inspired at least one monumental piece of music in Raff’s Fifth Symphony (excellently recorded some years ago by Bernard Herrmann). Liszt, whose work’s full title reads ‘Lenore – Ballade von Gottfried August Bürger mit melodramatischer Pianoforte-Begleitung zur Deklamation von F. L.’, does not approach such a scale, but he contributes quite a lot of music, sometimes in the briefest gestures, otherwise in longer through-composed sections. Some verses are spoken without music at all. Occasionally the music imitates the precise rhythm of a short poetic phrase, and from time to time one spoken phrase is exactly matched by one musical one. The musical language here is typical of the end of Liszt’s Weimar period, containing many characteristics which would not be out of place in one of the symphonic poems. The poetry of Bürger is perhaps not currently in favour, but the influence of Lenore upon succeeding German Romantics was prodigious. Der traurige Mönch (Ballade von Nicolaus Lenau) (‘The Sad Monk’) is the first intimation that Liszt gives us of the direction of the music of his old age: much of this piece, which is famous to musicologists if not familiar to audiences, is built entirely on whole-tone scales and harmonies (this two years before the birth of Debussy), and its other harmonic vocabulary makes much unsettling use of the augmented triad. Although the final cadences give us something like a cadence into C minor, ending on a first inversion chord, this piece is truly atonal – something which Liszt would not approach again until his very late works – and provides an accompaniment which far outstrips Lenau’s poem in its intensity. Unusually, Helges Treue (‘Helge’s Loyalty’) derives from another composer’s work: Felix Draeseke (1835-1913) composed a song to the ballad by Moritz, Graf von Strachwitz, and Liszt, who did much to encourage his pupil Draeseke’s work, adapted it as a recitation. For some reason Liszt’s piece remained unpublished until 1874 when his interest in melodrama returned. The music is fulsomely Romantic, and Liszt’s fingerprints are almost indistinguishable from the original once-famed student’s homage to his master’s style. From the end of the 1860s until his death in 1886 Liszt maintained much closer relations with his native Hungary than he had managed to do during his years as a touring artist and his time as Kapellmeister at Weimar. He made sporadic attempts to master the Hungarian language, writing a few songs and a couple of choral works in that tongue. But his Hungarian was never to become fluent and it is not surprising that A holt költö szerelme (‘The Dead Poet’s Love’) emerges as Liszt’s best musical work to a Hungarian text. This famous poem by Mór Jókai refers to his friend the great Hungarian poet Sándor Petöfi (1823-1849) who disappeared, believed killed in battle, during the War of Independence which he had championed. Liszt used the slow march theme from his recitation for a piano piece in Petöfi’s memory (Dem Andenken Petöfis, later revised as Petöfi Sándor – see Volumes 11 and 12 of this series, respectively). Liszt issued this recitation with the text in Hungarian alongside a parallel poetic translation in German, which we include amongst the complete texts here given. Liszt’s only song in Russian is a setting of Graf Alexey Konstantinovich Tolstoy, Ne brani menya, moi drug, of 1866. Tolstoy’s much longer poem Slyepoi (‘The Blind Man’) was the text for Liszt’s last recitation and he later adapted the music as a solo piano piece in 1878 (see Volume 11 of this series). The poem itself runs to some thirty verses and Liszt leaves quite a number unaccompanied. But the music somehow seems to preserve its continuity, notwithstanding, as in each of these pieces when Liszt allows the poet centre stage. This last recitation also manages something which the others do not: a radiantly triumphant peroration. This work was first published with the original Russian text with a parallel poetic German translation (included here), although the version as printed in the old collected Liszt-Stiftung unaccountably omitted the Russian. Les œuvres enregistrées ici ont été comprises dans cette série pour la bonne et simple raison que le piano y est le seul instrument. C’est, en tout cas, une excellente opportunité de faire revivre cinq œuvres étranges et émouvantes, condamnées à l’oubli sous prétexte que le mélodrame n’était plus à la mode. Lénore était un poème très populaire à l’époque, et a inspiré au moins une œuvre musicale importante: la cinquième symphonie de Raff (admirablement enregistrée, il y a quelques années, par Bernard Herrmann). L’œuvre de Liszt, intitulée ‘Lénore – Ballade von Gottfried August Bürger mit melodramatischer Pianoforte-Begleitung zur Deklamation von F.L.’, n’est pas aussi monumentale, mais il a toutefois composé des traits musicaux importants, parfois par le geste le plus bref, parfois par des sections bien plus longues. Quelques vers y sont déclamés sans aucun accompagnement musical. Quelquefois, la musique imite avec précision la cadence d’une courte phrase poétique, et de temps en temps, une phrase est reproduite exactement par le rythme des notes. Là, le langage musical est typiquement de la dernière période Weimar de Liszt, contenant de nombreuses caractéristiques qui ne seraient pas déplacées dans l’un des poèmes symphoniques. La poésie de Bürger n’est peut-être plus actuellement appréciée, mais l’influence de Lénore sur la génération suivante des romantiques allemands fut prodigieuse. Der traurige Mönch (Ballade von Nicolaus Lenau) (‘Le moine triste’) est la première indication que Liszt nous donne sur l’orientation que prendra sa musique sur ses vieux jours: la plus grande partie de cette œuvre, bien connue des musicologues sinon du public, repose entiérement sur des gammes et des harmonies de tons entiers (ceci deux ans avant la naissance de Debussy), et le reste de son vocabulaire harmonique fait un usage insolite d’un accord augmenté. Bien que les dernières cadences nous rappellent une cadence en Do mineur, terminant sur un accord en premier renversement, ce morceau est vraiment atonal – une forme que Liszt ne reprendra que dans ses toutes dernières œuvres – et qui donne à l’accompagnement une intensité qui surpasse de loin celle du poème de Lenau. Exceptionnellement, Helges Treue (‘Le dévouement de Helge’) provient de l’œuvre d’un autre compositeur: Felix Draeseke (1835-1913). Il composa une chanson pour la ballade de Moritz, Graf von Strachwitz, et Liszt, qui en fit beaucoup pour encourager le travail de son élève Draeseke, l’adapta lui-même en récitation. Etonnament, ce morceau de Liszt ne fut publié qu’en 1874, date à laquelle il retrouva un certain intérêt pour le mélodrame. La musique y est pleinement romantique, mais le style de Liszt y est presque identique à celui du célèbre élève rendant hommage à son maître. De la fin des années 1860 jusqu’à sa mort en 1886, Liszt se rapprocha de sa Hongrie natale dont il s’était tenu éloigné si longtemps pendant ses années d’artiste errant en tournée et de Kapellmeister à Weimar. Il tenta à plusieurs reprises d’apprendre le Hongrois. Il composa d’ailleurs quelques chansons et deux œuvres chorales dans cette langue. Mais il ne le parla jamais couramment, et il n’est pas surprenant que A holt költö szerelme (‘L’amour du poète décédé’) demeure la meilleure œuvre musicale que Liszt ait créée sur un texte hongrois. Ce célèbre poème de Mór Jókai fait référence à son ami, le grand poète hongrois Sándor Petöfi (1823-1849) qui disparut, probablement tué au combat pendant la guerre d’indépendance qu’il avait supportée. A la mémoire de Petöfi, Listz adopta le thème de la marche lente tirée de cette récitation pour un morceau de piano (Dem Andenken Petöfis, revisée plus tard sous le titre de Petöfi Sándor – voir respectivement les volumes 11 et 12 de cette série). Liszt publia cette récitation avec le texte en Hongrois et en parallèle une traduction allemande, que nous insérons parmi les textes complets ci-joints. L’unique chanson, en Russe, de Liszt est basée sur un texte de Graf Alexey Konstantinovich Tolstoy ‘Ne me réprimand pas, mon ami’, de 1866. Slyepoi (‘L’aveugle’), un poème bien plus long de Tolstoi, fut le texte pour la dernière récitation de Liszt dont il adapta plus tard la musique en solo pour piano en 1878 (voir le volume 11 de cette série). Le poème en lui-même contient une trentaine de vers et Liszt en laisse un bon nombre sans accompagnement. Mais la musique semble exprimer une continuité malgré le rôle central que Liszt accorde au poète dans chacune de ses œuvres. Cette dernière récitation surpasse les autres par sa péroraison radieuse. Cette œuvre fut d’abord publiée dans son texte original russe avec une traduction allemande en parallèle, bien que la version publiée dans la collection Liszt-Stiftung ommette inexplicablement le texte russe. Das Salon-Melodrama mit instrumentaler Begleitung war eine ziemlich beliebte Kunstform des 19. Jahrhunderts, deren Vorfahren sich im Bereich der Oper und des Singspiels und deren Nachkommen in Werken wie Pierrot lunaire und Peter und der Wolf befinden. Neben vielen anderen versuchten auch Schubert und Richard Strauss die Rezitation mit Klavier. Die von Strauss komponierte Begleitung zu Tennysons Enoch Arden mit über eine Stunde Spielzeit verdient wahrscheinlich einen ersten Preis als das umfangreichste Werk in diesem Genre; das einzige Werk Schuberts dieser Form (Abschied von der Erde) ist im Graham Johnsons Zusammenstellung der gesamten Schubert Lieder für Hyperion enthalten, und Liszt komponierte fünf. (Ein Sechstes, Der ewige Jude mit Text von Schubart, wird zwar auf mehreren Listen zweifelhafter oder verlorener Werken erwähnt, doch ist es für uns bisher unaufspürbar geblieben; die Kataloge führen auch Vor hundert Jahren, S.347, als Melodrama mit Orchester auf, doch eigentlich ist dieses Werk ein dramatischer Dialog für die Bühne samt Erzähler, zwei Darsteller und Orchester. Ausserdem zitiert es einige Themen, die sich anderen Werken oder Arrangements von Liszt zugesellen: nämlich das Trio von der ‘Marsch der drei Könige’ aus Christus, Gaudeamus igitur, die Ode ‘An die Freude’ von Beethovens 9. Symphonie, und Le mal du pays aus dem ersten der Années de Pèlerinage). Die Werke, die hier in der Aufnahme aufgeführt werden, befinden sich in dieser Serie aus dem recht guten Anlass, dass das Klavier das einzig beteiligte Instrument ist. Es bietet in jedem Fall eine ausgezeichnete Gelegenheit, fünf seltsame und bewegende Werke aus den verstaubten Regalen zu retten, in welche sie mit keiner besseren Begründung verbannt worden sind, als dass die Kunstform des Melodramas aus der Mode geraten war. Lenore war zu seiner Zeit eine sehr populäres Gedicht und auch die Inspiration für mindestens ein monumentales Musikstück: nämlich Raffs Fünfte Symphonie (grossartig festgehalten vor einigen Jahren in einer Aufnahme von Bernhard Herrmann). Liszt, dessen Werk mit vollständigem Titel ‘Lenore – Ballade von Gottfried Bürger mit melodramatischer Pianoforte-Begleitung zur Deklamation von F.L’, lautet, erreicht nicht ganz so ein Ausmass, trägt dafür aber eine Menge Musik bei, mal mit den flüchtigsten Gesten und ansonsten mit längeren durchkomponierten Passagen. Manche Verse werden überhaupt ganz ohne Musik gesprochen. Ab und zu bildet die Musik den präzisen Rhythmus einer kurzen poetischen Phase nach, und von Zeit zu Zeit stimmt eine gesprochene Phrase mit einer entsprechenden musikalischen überein. Die musikalische Sprache an diesen Stellen ist typisch für das Ende Liszts Weimarer Periode, indem sie viele derjenige Charakteristiken enthält, die in einem der sinfonischen Gedichte nicht fehl am Platz wären. Es mag sein, dass die Poesie Bürgers heutzutage nicht gerade in besonderer Gunst steht, doch der Einfluss von Lenore auf die nachkommenden deutschen Romantiker war ausserordentlich gross. Der traurige Mönch (Ballade von Nicolaus Lenau) ist die erste Andeutung, die Liszt uns von der Musikrichtung seiner reiferen Jahren gibt: ein grosses Teil dieses Stücks, das zumindest bei Musikologen, wenn nicht beim Publikum, vertraut ist, ist insgesamt auf Ganzton-Reihen und Harmonien aufgebaut (und das zwei Jahre vor der Geburt Debussys). Sein übriges harmonisches Vokabular macht eine Menge äusserst beunruhigenden Gebrauch vom vergrössernden Dreiklang. Obgleich die Schluss-Kadenzen uns etwas bieten, wie eine Kadenz in C-moll, endend auf einem ersten Umkehr-Akkord, ist dieses Werk wahrhaftig atonal – etwas, das Liszt bis zu seinen viel späteren Werken nicht wieder anstreben würde – und er schafft eine Begleitung, die in ihrer Intensität das Gedicht von Lenau bei weitem übertrifft. Ungewöhnlicherweise entstammt Helges Treue aus der Arbeit eines anderen Komponisten: Felix Draeseke (1835-1913). Er komponierte ein Lied zu der Ballade von Moritz, Graf von Strachwitz, und Liszt, der einiges tat, um seinen Schüler Draeseke und seine Arbeit zu ermutigen, übernahm es in der Form einer Rezitation. Aus irgendeinem Grund blieb dieses Werk von Liszt bis 1874 unveröffentlicht, bis sein Interesse am Melodrama erneut auftrat. Die Musik ist überschwenglich romantisch, und die Fingerabdrücke Liszts sind kaum zu unterscheiden von denen seines einst berühmten Schülers in seiner Homage an den Stil seines Meisters. Vom Ende der 1860-er bis zu seinem Tod im Jahre 1886 unterhielt Liszt weitaus engere Beziehungen zu Ungarn, dem Land seiner Geburt, als es ihm während den Jahren seiner Tournee Tätigkeit und als Kapellmeister in Weimar möglich war. Er machte sporadische Versuche, die ungarische Sprache zu meistern, und komponierte sogar einige Lieder und ein paar Choralwerke in der Sprache. Jedoch beherrschte er sie nie fliessend und deswegen überrascht es kaum, dass A holt költö szerelme (‘Des toten Dichters Liebe’) als das beste Werk von Liszt zu einem ungarischen Text hervortritt. Dieses berühmte Gedicht von Mór Jókai bezieht sich auf seinen Freund, den grossen ungarischen Dichter Sándor Petöfi (1823-1849), der während des von ihm unterstützten Unabhängigkeitskriegs verschwand, vermutlich im Kampf gefallen. Als Thema für ein Klavierstück im Andenken an Petöfi, (Dem Andenken Petöfis – später als Petöfi Sándor überarbeitet – siehe Band 11 bzw 12 jeweils aus dieser Serie) verwendete Liszt den langsamen Marsch aus seiner Rezitation. Liszt gab diese Rezitation im ungarischen Text gleichzeitig mit einer deutschen Übersetzung dazu heraus, die wir hier in den vollständigen Texten beifügen. Das einzige Lied Liszts in der russischen Sprache ist eine Vertonung des ‘Weis mich nicht ab, mein Freund’ von Graf Alexey Konstantinovich Tolstoy im Jahre 1866. Das um vieles längere Gedicht Tolstoys, Slyepoi (‘Der blinde Sänger’) bildete den Text für die letzte Rezitation von Liszt und später im Jahre 1878, überarbeitete er die Musik als ein Werk für Soloklavier (siehe Band 11 dieser Serie). Das Gedicht selbst besteht aus dreissig Versen, von denen Liszt eine ganze Anzahl ohne Begleitung lässt. Nichtdestoweniger scheint die Musik ihre Kontinuität zu bewahren, wie in jedem dieser Stücke, in denen Liszt dem Dichter den Bühnenmittelpunkt überlässt. Ausserdem erreicht diese letzte Rezitation etwas, was in den anderen nicht vorkommt: einen strahlenden, triumphierenden Redeschluss. Das Werk wurde zuerst im russischen Originaltext gleichzeitig mit einer deutschen Übersetzung herausgegeben, obwohl unerklärlicherweise die Ausgabe in der alten Sammlung der Liszt-Stiftung die russische Version auslässt.